The Go Blue Hawaii Sweepstakes (gobluehawaiisweeps.com) is open only to individuals who are legal residents and physically located in one (1) of the fifty (50) United States or D.C., who are eighteen (18) years of age or older. 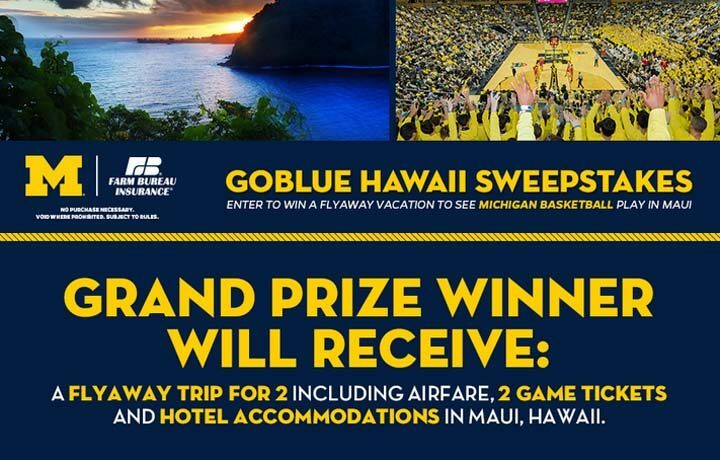 The Go Blue Hawaii Sweepstakes ends at 11:59 p.m. ET on October 31. To enter, during the period, visit gobluehawaiisweeps.com and follow the entry instructions. Limit one (1) entry per person per day. There will be one (1) grand prize, which shall include: Two (2) Tickets to the Maui Invitational for games Michigan Basketball is participating in, Two (2) Flights, and hotel room for the duration of the stay and the Retail Value (“ARV”) of the Prize is: Five Thousand Dollars ($5,000). Go Blue in Hawaii would be a dream come true!